A simple call or email to our office connects you with our friendly office staff. They will find a convenient time when Lillian can meet with you and anyone involved with your project. As we set up this free consultation you will be asked for your name, address, phone numbers and areas you are planning to have done. An emailed confirmation will be sent to you once a date and email address have been obtained. Next we study the area to be designed. The more information that can be gathered at this point the better. We will listen as you explain any ideas you may have and will then offer suggestions or ask questions that will narrow in on ideas and needs. Our extensive portfolio viewed during this consultation will help visualize concepts. Careful measurements will be taken as well as photos, fabrics (if available), and furniture styles will be considered. Paint colors will be chosen for concept boards. A detailed proposal will be written with a room by room description explaining each area, priced individually so that rooms can be added or removed as your budget allows. Once approved sample boards are then produced; boards are free of charge and can be refined as necessary. After acceptance, a deposit is required to order materials. (Pay pal, Visa, Master Card, Discover, American Express, check or cash can be used), a date is scheduled and the project moves into production. 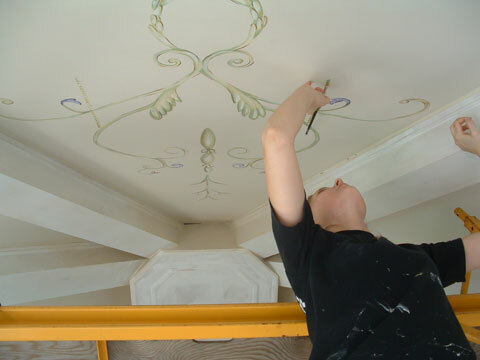 A client number is then assigned and you can view the progress of your project as well as communicate with Lillian’s Paintbrush and all parties concerned via the partner portion of our web site.